Launchpad: Marriage is a place for ‘Value addition’. Inasmuch as it’s a place for giving, it’s a refinery. Whatever raw materials you had invested in yourself, the products are seen in the marriage institution. That’s why it is very important to make a good investment of your being during singleness. It’s never too late to start building on your character, values, discipline and godly virtues. While you are still at it, the gift of a wife comes with the grace to love and to hold. God knows that you can handle her and you can be the best for her, (that is, if you are not yet there already). He has entrusted you with a beautiful soul to nurture and to take care of. In a world where the woman has been sidelined, the man must rise up and put her in her rightful place of respect and honor. Many a men fear empowering their wives. They think that they might overtake them or worse yet rule over them. The fear of being inferior creeps in. Gentlemen please, no one will ever take your God given positions of leadership and authority. They are sacred and divine. They are our birthrights and it’s only us can give them away (Ref the story of Esau and Jacob in the Bible). Giving your spouse space to excel is a noble undertaking. Enabling her fulfill God’s purpose for her life is a worthy course. Though shall not be a hindrance to her progress. If your wife has been called to serve in a particular area of ministry, let her be. Support her and God’s grace will be sufficient. If she wants to further her studies, why not? If she to be better in some areas in her life, motivate her. Help her rise through the ranks. The man should not let the inadequacies of his wife deter her from being what she would like to be. In 1 Samuel 1, we see Elkanah building his wife Hannah through words of affirmation and consequently healing the wounds caused by her co-wife Peninnah. Later God opens up her womb and Samuel is born! Elkanah gave her enough strength as she was patiently waiting upon the Lord to remember her. He elevated her spirits and was her support system through it all. He covered her I adequacies with grace and love. A similar scenario is depicted in the story of Jacob and Rachel. God shows up when men purpose to support and build their wives. And He shows up in a ginormous way. 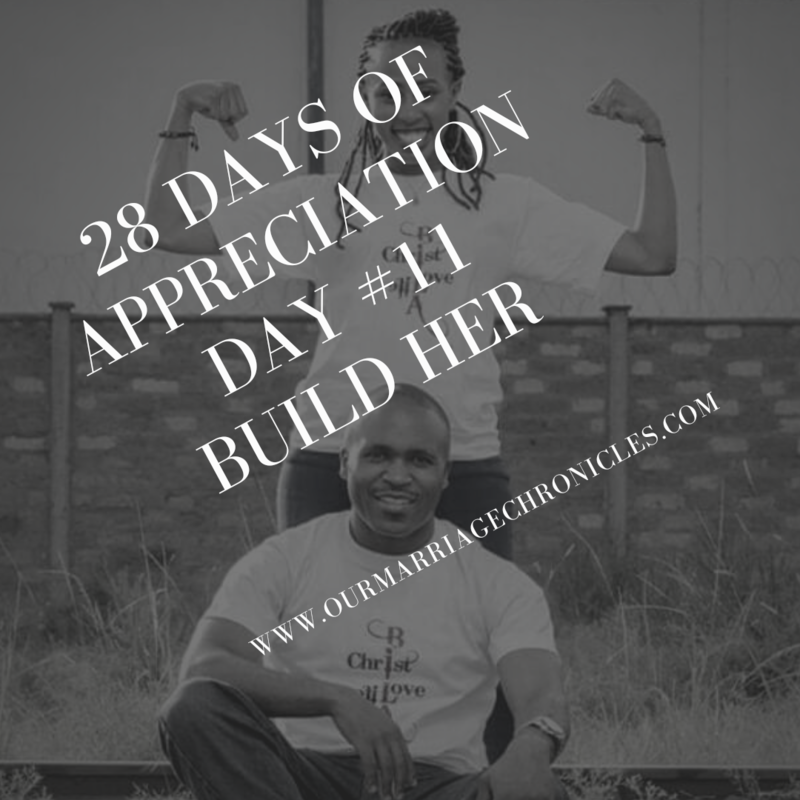 Today I pray that you will find grace to build your wife. Her worth should be greater than when you first met. Her credentials should be higher than when you tied the knot. Did she come into your life just to be called Mrs or a mother? Absolutely not. Her status should be higher by now, regardless of the age of your marriage. Make a deliberate intention to build her today. Philippians 4:13; I can do all things through [a]Christ who strengthens me. Ever living GOD, work in me both to will and to do of his good pleasure.